We visited the Lago di Como area in August 2009. We saw many wonderful things, that we would very much like to share with you. 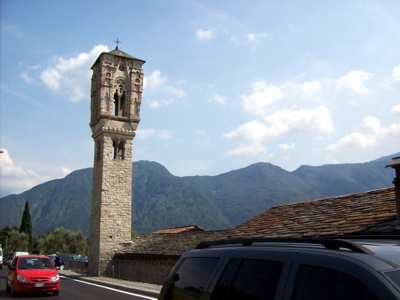 The Roman Belltower in Ossucio, symbel of the Lago di Como. We hope the photos will dazzle you as much as the actual views dazzled us and invite you to discover all the sites together with us. For each location below, we have created a special webpage. So go ahead and click the titles to discover more. We even provide the GPS-coordinates for your convencience. 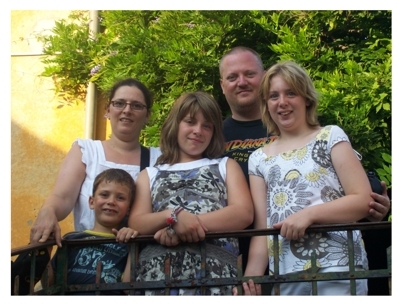 The Dermul Family in Italy: Sofie, Mark, Kobe, Amber and Sarah. Please be so kind as to not copy anything from these pages without prior consent of the webmaster. This site is in no way affiliated with Lucasfilm Ltd. or Metro-Goldwyn-Mayer Inc., who are the owners of all the rights to the franchises of Star Wars and the James Bond, resp. Lucasfilm Ltd. nor Metro-Goldwyn-Mayer Inc. endorse or authorize this website.